A multidisciplinary group that includes the University of Illinois at Urbana-Champaign and the University of Washington at Tacoma has developed a novel platform to diagnose infectious disease at the point-of-care, using a smartphone as the detection instrument in conjunction with a test kit in the format of a credit card. The group is led by Illinois Electrical and Computer Engineering Professor Brian T. Cunningham; Illinois Bioengineering Professor Rashid Bashir; Dr. Ian Brooks, a research scientist affiliated with the School of Information Sciences at Illinois; Professor Steven Lumetta, faculty at Illinois' Electrical and Computer Engineering department; and, University of Washington at Tacoma Professor David L. Hirschberg, who is affiliated with Sciences and Mathematics, division of the School of Interdisciplinary Arts and Sciences. Findings have been published in Analytical Chemistry, demonstrating detection of four horse respiratory diseases, and in Biomedical Microdevices, where the system was used to detect and quantify the presence of Zika, Dengue, and Chikungunya virus in a droplet of whole blood. An additional project collaborator included Dr. David Nash, a private practice equine expert and veterinarian in Kentucky. The low-cost, portable, smartphone-integrated system provides a promising solution to address the challenges of infectious disease diagnostics, especially in resource-limited settings or in situations where a result is needed immediately. The diagnostic tool’s integration with mobile communications technology allows personalized patient care and facilitates information management for both healthcare providers and epidemiological surveillance efforts. Importantly, the system achieves detection limits comparable to those obtained by laboratory-based methods and instruments, in about 30 minutes. A useful capability for human point-of-care (POC) diagnosis or for a mobile veterinary laboratory, is to simultaneously test for the presence of more than one pathogen with a single test protocol, which lowers cost, saves time and effort, and allows for a panel of pathogens, which may cause similar symptoms, to be identified. Infectious diseases remain the world’s top contributors to human death and disability, and with recent outbreaks of Zika virus infections, there is a keen need for simple, sensitive, and easily translatable point-of-care tests. Zika virus appeared in the international spotlight in late 2015 as evidence emerged of a possible link between an epidemic affecting Brazil and increased rates of microcephaly in newborns. Zika has become a widespread global problem—the World Health Organization (WHO) documented last year that since June 2016, 60 nations and territories report ongoing mosquito-borne transmission. Additionally, since Zika virus infection shares symptoms with other diseases such as Dengue and Chikungunya, quick, accurate diagnosis is required to differentiate these infections and to determine the need for aggressive treatment or quarantine. The technology is intended to enable clinicians to rapidly diagnose disease in their office or in the field, resulting in earlier, more informed patient management decisions, while markedly improving the control of disease outbreaks. An important prerequisite for the widespread adoption of point-of-care tests at the patient’s side is the availability of detection instruments that are inexpensive, portable, and able to share data wirelessly over the Internet. 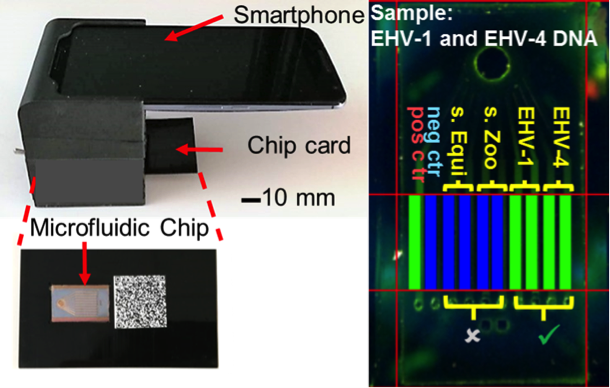 The system uses a commercial smartphone to acquire and interpret real-time images of an enzymatic amplification reaction that takes place in a silicon microfluidic chip that generates green fluorescence and displays a visual read-out of the test. The system is composed of an unmodified smartphone and a portable 3D–printed cradle that supports the optical and electrical components, and interfaces with the rear-facing camera of the smartphone. 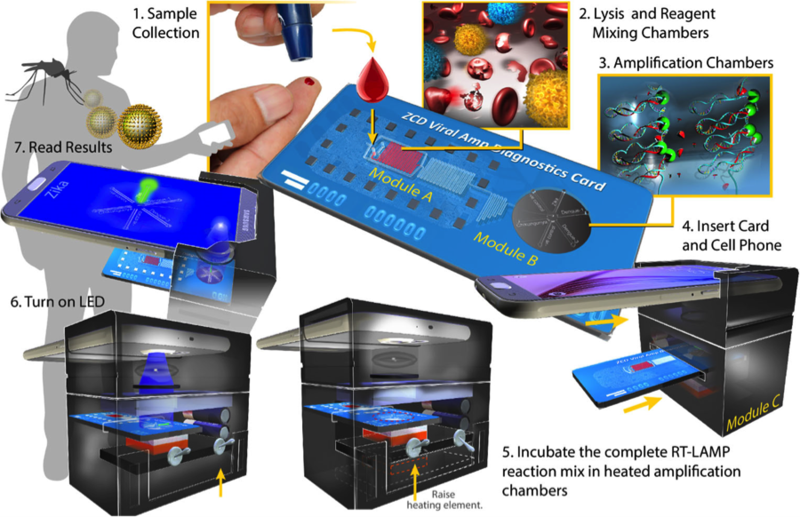 The software application operating on the smartphone gathers information about the tests conducted on the microfluidic card, patient-specific information, and the results from the assays, that are then communicated to a cloud storage database. The system represents the only platform to date that can multiplex detection of viral and other nucleic acid targets on a portable point-of-care setup using one droplet of bodily fluid, including whole blood. Members of the research team include: Weili Chen, Hojeong Yu, Fu Sun, Akid Ornob, Ryan Brisbin, Anurup Ganguli, Vinay Vemuri, Piotr Strzebonski, Guangzhe Cui, Karen J. Allen, Smit A. Desai, Weiran Lin, David M. Nash, G.L. Damhorst, A. Bhuiya, David L. Hirschberg, Ian Brooks, Rashid Bashir, and Brian T. Cunningham. To reach Brian T. Cunningham, please email bcunning@illinois.edu. The work was funded by NSF grant 1534126 and the University of Illinois at Urbana-Champaign. Any opinions, findings, conclusions, or recommendations in this work are those of the authors and do not necessarily reflect the views of the National Science Foundation. The University of Illinois Micro + Nanotechnology Laboratory (MNTL), is one of the country's largest and most sophisticated university facilities for conducting photonics, microelectronics, biotechnology, and nanotechnology research. A crown jewel of the University of Illinois College of Engineering, MNTL is the place where campus researchers and visiting scientists come to design, build, and test innovative nanoscale technologies with feature sizes that span the range of atoms to entire systems. The building houses faculty and graduate students from the departments of Electrical & Computer Engineering, Bioengineering, Physics, Mechanical Science & Engineering, Material Science & Engineering, Agricultural and Biological Engineering, and Chemical & Biomolecular Engineering. For more information on this story, or for other MNTL media inquiries, please contact Janet McGreevy, Assistant Director of Communications, at mcgreevy@illinois.edu. A user facility, MNTL provides 300 students and other researchers with all the advanced tools they need for conducting photonics, microelectronics, biotechnology, and nanotechnology research. Send an email to MNTL.